The multi-billion dollar Raytheon-built military JLENS surveillance blimps are pictured above. They are supposed to sense and alert us to a possible devastating surprise cruise missile attack on the U.S. eastern seaboard. However, one of them lost its tethering and went sailing into the skies and had to itself be tracked by NORAD and two scrambled F-16 fighter jets. What was designed to surveil instead needed surveillance. 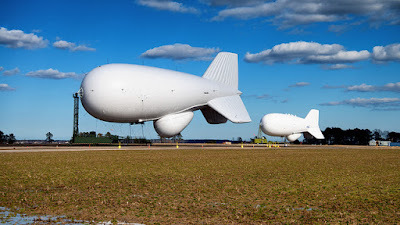 The JLENS crashed landed in Amish country, Pennsylvania and took out the power to 20,000 people. We need a strong, capable, and ready military!